Instructor User Guide Web ContentHow do I delete a Web Content link? 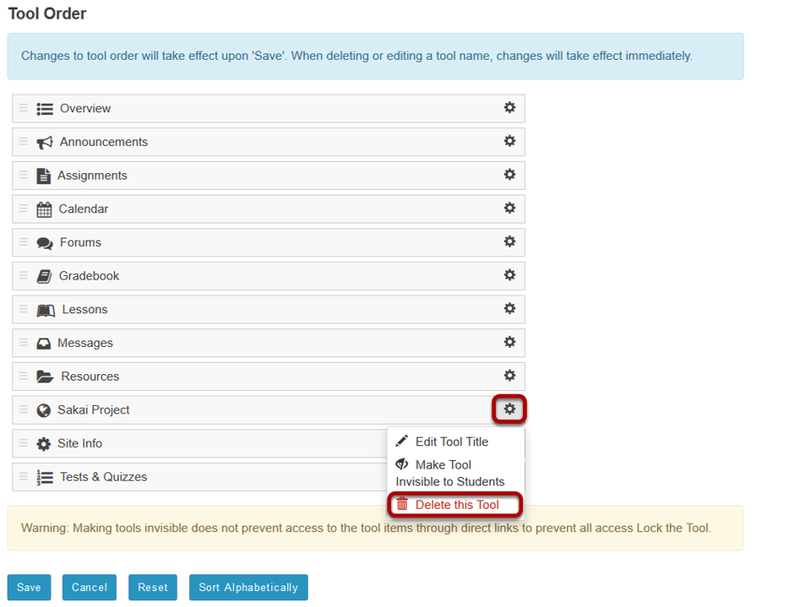 Select Site Info from the Tool Menu in your site. Un-check the Web Content tool link. Remove the check mark next to the Web Content tool link that you want to delete. Zoom: Or, click Tool Order. Click the gear icon to edit item settings. Zoom: Click the gear icon to edit item settings. Click the gear icon for the item you want to remove, and then select Delete this Tool from the drop-down menu. If you are sure you want to delete the item, click OK.
Prev: How do I edit a Web Content link? Next: What is the Wiki tool?